Basic-Fit is the largest budget fitness chain in the Netherlands. Their impressive “virtual fitness” concept is implemented at all locations across The Netherlands and Belgium. In addition to live lessons, Basic-Fit offers their clients virtual group lessons to provide a comprehensive experience. Basic-Fit approached System Integrator First Impression to help make virtual group lessons a reality for their clients. First Impression designed the concept and engineered the system, using Scala Software as the content management system. 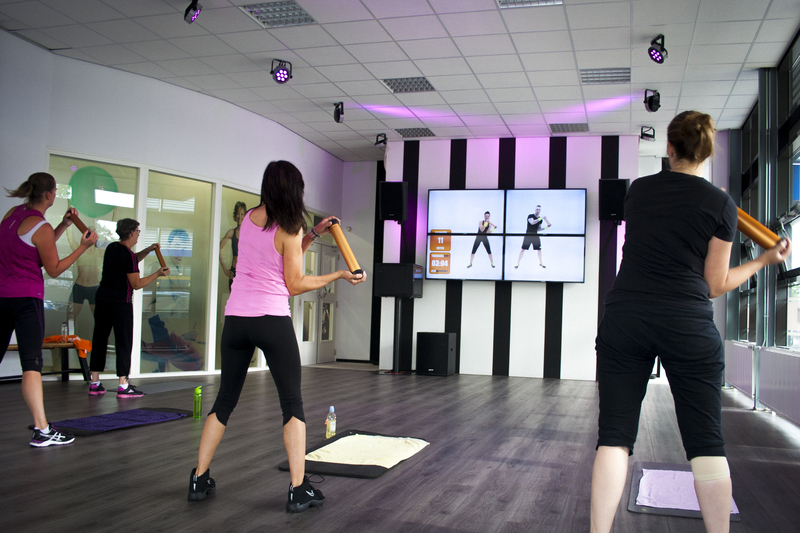 After concept creation, First Impression installed the “Virtual Fitness Experience” in more than 170 locations in The Netherlands and Belgium. The available space to install the Virtual Fitness Experience varied between locations. The complete setup had to be flexible to fit in any given environment and still maintain a consistent look & feel. It was also important that the system was designed to be very reliable and have complete stand-alone functionality as each fitness club is managed by only 1 or 2 staff members. Finally, the management of group lessons had to be very simple because of the large number of available time-slots and locations. First Impression designed a complete solution that consists of a Full HD video wall, powerful sound system and colorful LED lighting set. With this equipment, a room is transformed into an active experience. The virtual lessons incl. audio en lightning (DMX) scripts are managed and distributed by Scala. Additional narrowcasting displays on central positions show not only news items and customers’ marketing content, but also an automatically updated schedule for the virtual and live lessons in that location. An attractive countdown informs customers of the next available lesson so they can plan a personal workout schedule. All players (300+) were integrated with multi-language support and a set of metadata for easy planning and displaying correct content items automatically. Players can be updated all at once, per country, per region or individually. 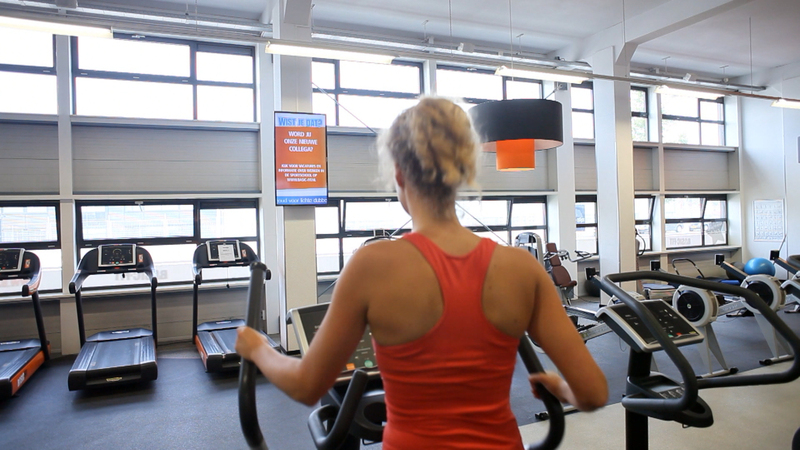 To save power and reduce costs, the opening times for each Virtual Fitness Experience location were implemented with Scala software, which ensured that the system was only active during designated periods. The flexibility and stability of Scala software supported all customer requirements and led to an easy-to-manage digital signage network. First Impression created an intelligent back-end system in which the customer can schedule live and virtual lessons. The scripts made it possible for the Virtual Fitness system, narrowcasting displays, customers’ website and mobile app to always present the correct schedule automatically. The system can also connect to social media. In a three-month period, First Impression successfully installed the Virtual Fitness Experience in over 170 Basic-Fit locations. The complete Scala setup is done in-house together with the producers of the virtual lessons. The result is an easy-to-manage system that’s proven to be stable and impactful. Many Basic-Fit clients attend the virtual lessons, share their experiences via social media and provide positive feedback. Basic-Fit is one of Europe’s market leader in the fitness center industry. First Impression is a creative system integrator specialized in the sales and rental of professional audiovisual solutions in the B2B market. Their customers are divided across different branches: retail, sporting facilities, businesses, institutions, education and government.